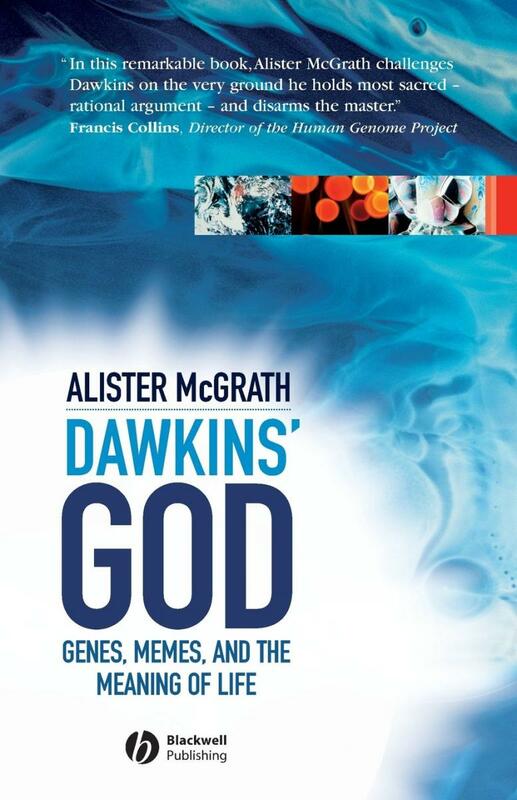 Alister McGrath, Dawkins' God: Genes, Memes, and the Meaning of Life, Blackwell Publishers, 2004, 202 pages, ISBN 1405125381 (paperback). In Reproductive BioMedicine Online, Richard Holloway declared that he felt some sympathy for “the lumberingly awkward religious communities” because their “commanders ... have to maneuver their ancient barnacle-encrusted galleons through these modern torrents” of bioethical debates (2005;10 (suppl):137-9). The role of religious belief in bioethics is increasingly under attack. Leading that assault in Britain and Ireland is Richard Dawkins, Professor of the Public Understanding of Science at Oxford University. The view of science that he so persuasively offers society, however, is that evolutionary biology and logical reasoning make religion not only unbelievable, but unethical—a parasitic “virus of the mind.” A review of his recent collection of essays, A Devil’s Chaplain (Weidenfeld & Nicolson, 2003), noted that Dawkins “has swung from writing about science for a popular audience to waging an all-out attack on Christianity” (Michael Ruse, American Scientist 2003;91:554-6). Alister McGrath has provided the first book-length refutation of Dawkins’ claims in Dawkins’ God: Genes, Memes, and the Meaning of Life. McGrath is a molecular biophysicist and theologian and is currently also at Oxford University as Professor of Historical Theology. His book does not seek to demonstrate how Dawkins’ claims differ from Christianity. Rather, McGrath points out how Dawkins’ arguments fall far short of the very logical and evidence-based reasoning that Dawkins himself espouses. Dawkins’ proposal that ‘memes’ explain the evolutionary development of human culture is more illogical and unscientific than a clearly articulated defense of Christianity. McGrath demonstrates how Dawkins’ rejection of faith is a classic straw man argument. Dawkins’ definition that faith “means blind trust, in the absence of evidence” is not a Christian position, nor would many thoughtful people of any religion hold to it. In contrast, accepting Dawkins’ definition would require blind trust since he offers no evidence to support it! Rather, it is based upon, what McGrath calls, “an unstated and largely unexamined cluster of hidden non-scientific values and beliefs” (p. 92). McGrath then demonstrates how Dawkins frequently violates the very tenets of evidence-based reasoning that Dawkins himself claims to uphold and use to dismiss all religious belief. Although McGrath does not address bioethics itself, his approach to evaluating Dawkins’ arguments provides a helpful and useful model. He shows by example how the principles of logical reasoning and critical thinking can be usefully applied to controversial topics—and claims like those of Holloway quoted above. Dawkins himself has written some material addressing bioethical issues. His arguments arise out of the same anti-religious, science-has-all-the-answers polemic that McGrath so clearly refutes. As such, examining McGrath’s arguments will help anyone interested in furthering dialogue between science and religion, in particular when the two fields collide as they sometimes do in areas of biotechnology and bioethics.